Rock Paper Lizard: Winged nutlets. 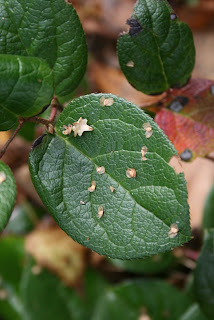 Birch seeds on salal leaf. There's dandruff in the forest, scattered on every surface. It's the disintegrated remains of female birch flowers, which are cone-like catkins, and consists of the scales of the "cones" intermixed with the seeds, which are known as winged nutlets. 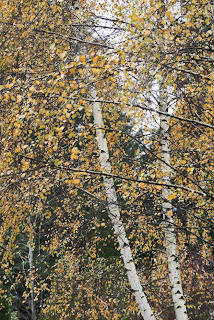 Paper birch is the dominant native deciduous tree in Richmond, and is associated with peat-bog remnants. It thrives, weed-like, in modified bogs and disturbed areas where more nutrient-rich soil has been added to the original peat. Because its seeds are windblown, it is a fast colonizer, producing almost instant forests. Suburban birches of uncertain parentage. 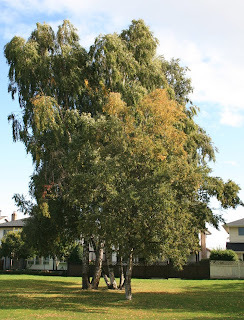 Added to the native birch are exotic, often weeping, forms planted throughout this suburban landscape. It's likely that hybrid trees are common. This year's female catkins (thick) and next year's catkins (thin). The catkins, which open in spring before the trees leaf out, are monoecious, each being either male or female. 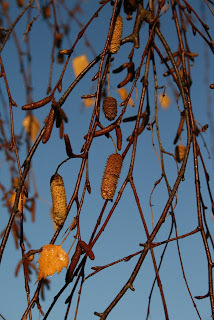 By mid-November, most of the catkins remaining on the trees are female, slowly disintegrating and broadcasting seeds. If you roll one between your fingers it easily crumbles apart. In the slightest breeze the seeds disperse. 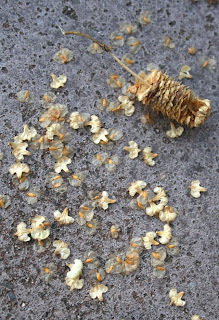 Catkin scales and winged nutlets. A great tree! Folks try to grow the river birches down here and they look so sickly! Not enough moisture? A very clever post title, too! But you left out the most important part! Are they right-winged nutlets or left-winged nutlets? Or maybe centrist nutlets, though that sounds like a contradiction in terms. I'm not sure about river birch, Gail, although the name suggests it likes having its feet wet. And thank you for the pick(s)! Mr. S, you raise a good point. It seems to me that they go whichever way the wind blows.